Cook the bean pieces in enough olive oil to lightly coat the bottom of a frying pan. Keep the burner at a medium-high setting and stir the beans frequently for about 5 minutes until they take on a light golden-brown color. Spoon just enough chicken or vegetable broth over the beans to cover the bottom of the pan. Reduce the heat to medium and stir the beans occasionally for the next 4 to 5 minutes or until all the liquid is absorbed. 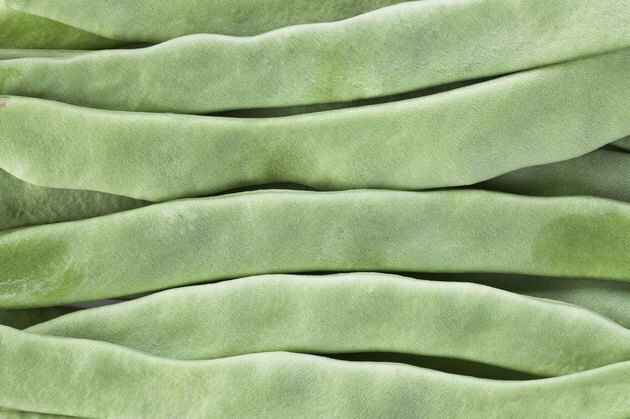 Blanch flat beans, cut into 2 inch-long segments, in an uncovered pot of boiling water for approximately 5 minutes or until they are tender. Pour the beans in a colander and run cold water over them until they are cool to the touch. Allow them to drain thoroughly before placing the beans in a separate bowl. Drizzle olive oil over the beans, a spoonful at a time, and toss until the bean segments are coated. Stir in salt and fresh-ground black pepper to taste. Spread the beans in a single layer on a nonstick cookie sheet and place in a preheated oven at 425 degrees Fahrenheit. Roast for 8 to 10 minutes or until the beans sizzle on the pan and are slightly browned. Cook slices of bacon until crispy in a deep-frying pan for Southern-style simmered green beans. Remove the bacon and all but a couple tablespoons of the fat from the pan. Alternatively, melt butter in the pan for a vegetarian dish. Brown diced aromatic vegetables such as onion, celery and garlic in the fat before adding cut flat beans and several dashes of hot pepper sauce to the pan. Pour enough water in to cover the lower half of the pan's contents. Turn the burner down to low and simmer the beans for half an hour, stirring every 5 to 10 minutes. Taste a bean segment and adjust the seasoning, if necessary, with a pinch of salt or additional hot sauce. Continue cooking for another 15 to 20 minutes until the flavors are melded and the flat beans are very soft and pliable. Stir in crumbled bacon or a squeeze of fresh lemon juice. Season roasted flat beans with red pepper flakes instead of black pepper for a spicier flavor profile. More mature flat beans and some heritage varieties have fibrous “strings” that run the length of the bean. These are tough and unpalatable, but can be removed by gently snapping the stem and pulling downward to separate the string from the bean.